A predetermined transmission capacity in the form of a number of time slots (ZS) is reserved for the base station (BTS') in order to transmit data between units, e.g. between a base station (BTS') and a base station controller (BSC') in a radio communication system via a transmission link (US). When a connection is being set up for voice or data transmission, one or more time slots (ZS) from the reserved transmission capacity are assigned to said connection by means of which the data is transmitted between the base station (BTS') and the base station controller (BSC'). The number of assigned time slots (ZS) depends on the service being transmitted via the connection. During the connection, the number of assigned time slots (ZS) can change dynamically if required. After the connection has been terminated, the assigned time slots (ZS) are freed and made available as part of the reserved transmission capacity. Radio communication systems are used to transfer data with the aid of electromagnetic waves via a radio interface between a transmitting and a receiving radio station. An example of a radio communication system is the known GSM mobile radio network, in which is provided for transmitting a subscriber signal in each case a gene by a narrow-band frequency range and a time slot channel formed. Since a subscriber signal is separated into a channel in frequency and time of other subscriber signals, the receiving radio station can carry out a detection of the data of this subscriber signal. In recent wireless communication systems such as the UMTS system, each participant will furthermore distinguished by different Spreizcodes-. te formed with 160 up to 1300 bits. As stated above, the transmission capacity is, however, each 16 kbps sub-time slots is limited to 320 bits, so that, for GPRS and EDGE only the coding with the lowest data rate, such as CS1, CS2, MCS1 and MCS2 are supported with today's technology NEN koen-. New circuit-switched packet services such as ECSD with transmission rates of up to 56kbps / 64kbps per time slot on the air interface require bigger UE bertragungskapazitaet than 320bit / 20ms. A radio communication system are given in which runs the process. The data transfer between two units of a radiocommunications nikationssystems via a transmission path on which to connect a predetermined transmission capacity in the form of a set of time slots is reserved. When you connect on the air interface for Sprachbzw. Data transmission can be a compound or the assigned several time slots from the reserved transmission capacity, via which the data transmission between the units. Thus, it is now possible to a channel on the air pattern pieces all total assign to N parallel time slots 20ms nx 320bit, which means that, for example, a data packet of 1300bit to 4 or 5 time slots is distributed and will wear at the same time. The procedure is for data transfer see both be- a base station and a base station controller as applicable between a base station controller and a transcoder (transcoding and rate adaptation unit TRAU) or between a transcoder (transcoding and rate adaptation unit TRAU) and a mobile switching center bar , Base station, base station controller transcoder (transcoding and rate adaptation unit TRAU) relationship as mobile switching center represent different units of the radio communication system in this case. Transmission capacity are released again. After completion of the connection of the connection assigned time slots saemtliehe released and are available as part of the reserved transmission capacity for other connections. P- P- P- ii - Hi P- P- P- 3 tr PH • o td P P J 03 Φ P P Ω <! P li tr he φ φ ti O & Φ. 01 O P- P- φ Ω Φ 3 P) PPO pr tr P- rt to Φ p.
LO U) to to HP "
Ω Φ rt HP) li P) rt) Φ Φ s P P P Φ 0 "03 ü φ Ω Φ P rt P LQ 0 φ ii Pi LQ rt Hi Φ Φ W td P) 0 ii Φ Ω P li Pi Pi rt 3 "ti P rt Pi Φ P Φ S et ii rt .omega. P LQ P 1 i tsi PJ P" P Pi rt P 3 "PP Φ P- LQ PN Φ rt LQ • P-. Φ P PPJ - rt P) St. PP 03 Φ Φ Φ Hi P 1 LQ li Φ Φ Φ P Φ Φ φ φ P.
P, 03 P) α - 3 O p, P rt Φ Φ P i j be Φ Φ rt P- Ω 03 PH PP CQ P a.
should. Even when reestablish a connection all the assigned time slots are synchronized naechst to-. Only then is the actual data transmission. Loses during the operation, a time slot synchronicity its overall genueber remaining time slots, it will be re-synchronized. The service is interrupted or allowed to continue on the remaining time slots with lower quality. Even with the rate adaptation of a service the additional time slots are synchronized once before rate matching is performed. According to one embodiment of the invention, a compound to be assigned a lower number of time slots, if the reserved transmission capacity, the number of requested time slots is not available. This approach has the advantage that in the event that no more time slots are available in the reserved transmission capacity sufficiently available, a connection can still be established or maintained. The transmitted via this connection service is then lower performance (quality of service) is available. There are existing connections of lower priority than the neuaufzubauende service in the cell, it is within the scope of the invention, the time slots of the existing low-priority connections in favor of the new service release (so-called service Downgra- de). Alternatively, low-priority connections in neighboring cells are shifted (handover, cell reselection). This possibility also exists for the new service if less performance is not tolerated, and there are no other connections to the downgrade in the cell. use while in the actual cell's light traffic. Furthermore, it is appropriate subsets of reserved transmission capacity for different services, transmission paths and / or transfer methods to reserve and also to define "soft" sleepers / barriers. Thus, the utilization of the transmission path for the different users and services is equally assured. Different transmission paths comprise both the transmission through different base stations, and the transmission over different carrier frequencies one and the same base station. the transmission can be both in the time multiplex Plex as done lexverfahren in frequency division or Spreizcodemultip-. different transfer methods include both the transmission of voice data as well as packet data according to different protocols, in particular the frame relay protocol and the Internet protocol. the different services include, in particular voice, data and / or Sig tionalisation. Should the transmission over a unit z. 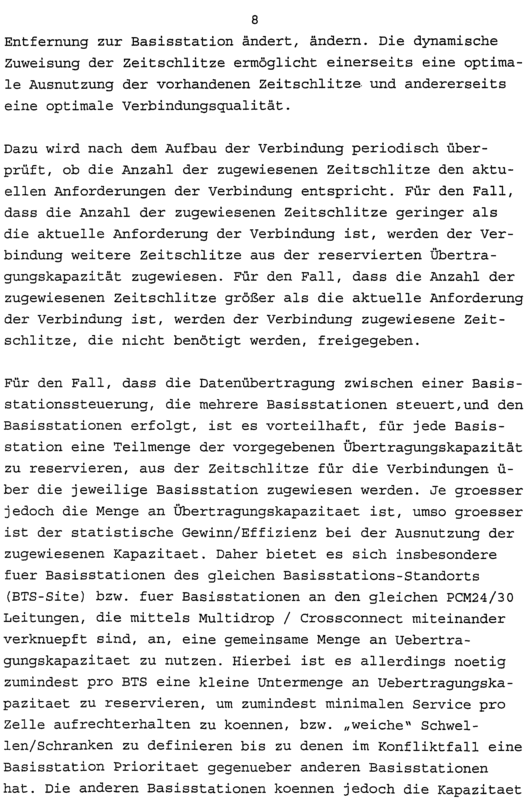 B. a base station, a service, a transmission path or a transfer method are preferred, it is within the scope of the inven- tion to provide the corresponding subset in a predetermined minimum size or ization due to a suitable Prio- ensure that, in case of conflict, low-priority services, Üebrtragungswege or transfer methods to release the corresponding capacity. In a network in which the proportions of the compounds on the individual base stations, services, transmission paths and / or transmission methods vary greatly, it is advantageous to change the size of the subsets of the reserved transmission capacity depending on the amount of connections of each type dynamic. If the size of the subsets such that the sum of the subsets is less than the total reserved transmission capacity is achieved that even if a kind of the compounds has exhausted the reserved for them subset of the transmission capacity, still Compounds of this type can be constructed , wherein use is made of the excess of the reserved transmission capacity. It is within the scope of the invention tragungsweg a service, an excess or to assign a higher priority to a transmission method. When establishing a connection, the requirements of compounds for the service transmission or the transfer method to be met with the increased priority in this case initially. Then the requirements are approximations of connections for services, transmission paths or transmission methods processed without increased priority. New connections with higher priority effect preferably always the downgrade or the deceleration (Queuing) or the handover / cell reselection low-priority connections, if available to the torque capacity is not sufficient. In a base station system having a base station and a base station controller a capacity allocation unit is preferably used in the base station controller, which controls the flow of the method and attempts to optimally satisfy all the Quality of Service requirements. Occupies a base station does not bertragungskapazitaet the entire allocated UE, the remaining Capacity is for internal data exchange between base station and base station controller at your disposal, such as data transmission for signaling, measuring and software download. Figure 2 shows a radio communication system in which a base station controller controls three base stations and the data transmission is effected by the inventive method between the base station controller and the base stations. Figure 3 shows a radio communication system in which a base station controller controls a base station and wherein the data transmission between the base station controller and the base station is carried out according to the inventive method. A base station controller BSC controls Λ three base stations BTS (see Figure 2). The base station controller BSC λ is connected to each of the base stations BTS via transmission routes X US. The transmission paths are as US PCM24 / 30- lines formed. Each of the base stations BTS is λ two PCM24 / 30 lines with the US Basisstationssteue- tion BSC Λ connected. On the PCM24 / 30 lines transmission over 16kbps timeslots ZS done. Each of the base stations BTS comprises a central control unit (core unit) GORE. In addition, each of the base stations BTS comprises λ carrier units (carrier unit) CU, which operate in different frequency windows. The outputs of the carrier units CU of one and the same base station BTS X are connected to a combiner (combiner) C, in which the signals of the different carrier units CU are given to an antenna A. Via the antenna A mobile stations MS are supplied with signals λ.
Ω <03 rt P P P 3 P • rr p. Φ xo P 03 01 3 0 Φ Φ φ φ H P H P Hi - 03 <! P Φ P) rt Φ XPPPP TJ 03 r PP Pi Pi P) Φ 03 P "φ CQ PP Φ φ <! Φ • P) P) p rt tr xo P P P P P Ω LQ Pi P rt φ P> tr φ PP LQ H.
P Φ P- P- - - CQ tr P. O rt LQ Pi P 1 P 3 P li n Φ Pi P- P P- P Φ φ. Speech data which are supplied to the GERAN base station controller GBSC of the rate adaptation unit TRAU 'is in 16kbps timeslots. Packet data that the base station controller wrangling GBSC are supplied via the G interface are λ divided into the packet data control unit PCU in radio blocks whose size depends on the used in the transmission Kodiertiefe. A radio block can contain from 160 to 1300 bits. Circuit switched data (CS) interface from the communication system of the third generation 3G CN are supplied to the common platform CP via the I U, and packet-switched data that the common platform over the Iu (PS) interface from the communication network of the third generation 3G CN are supplied to the packet data control unit PCU 1 are supplied and there is also divided into radio blocks of different sizes. In a structure of a connection between the base station controller BSC2 x and the base station BTS2 will be a compound of the capacity allocation unit of the base station controller wrangling GBSC or more time slots ZS * assigned. The number of assigned time slots ZS λ is dependent on the type of transmitted data and thus the size of the radio blocks and / or the distance of the mobile station MSi involved in the connection from the base station BTS λ '. Includes a radio block to be transmitted more than 320 bits, the maximum capacity of a lδkbps time slot, the connection will be allocated more time slots. This Zeitschlit- ze may be arranged on different lines of the transmission path or be spread in time. only three 16kbps timeslots needed. The superfluous two time slots are released back into the reserved transmission capacity and available to other connections. The packet data control unit PCU 1 in Fig. 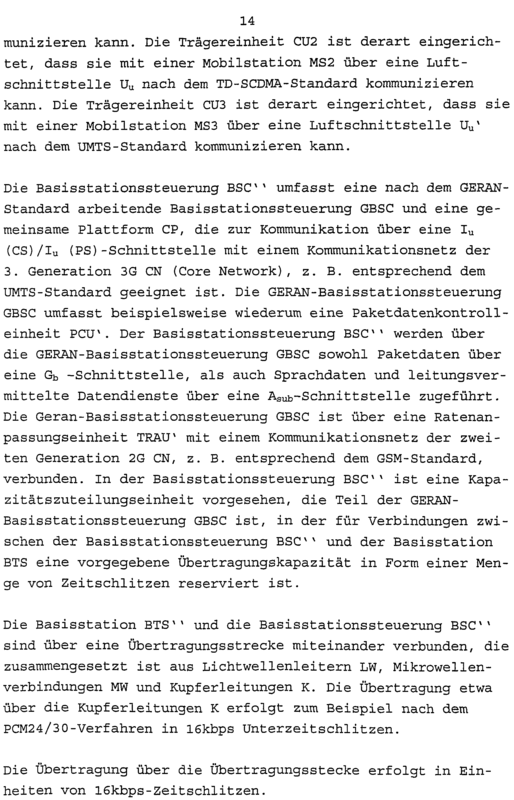 3 can be incorporated instead in the Basisstationssteueerung BSC 'in the base station BTS'. 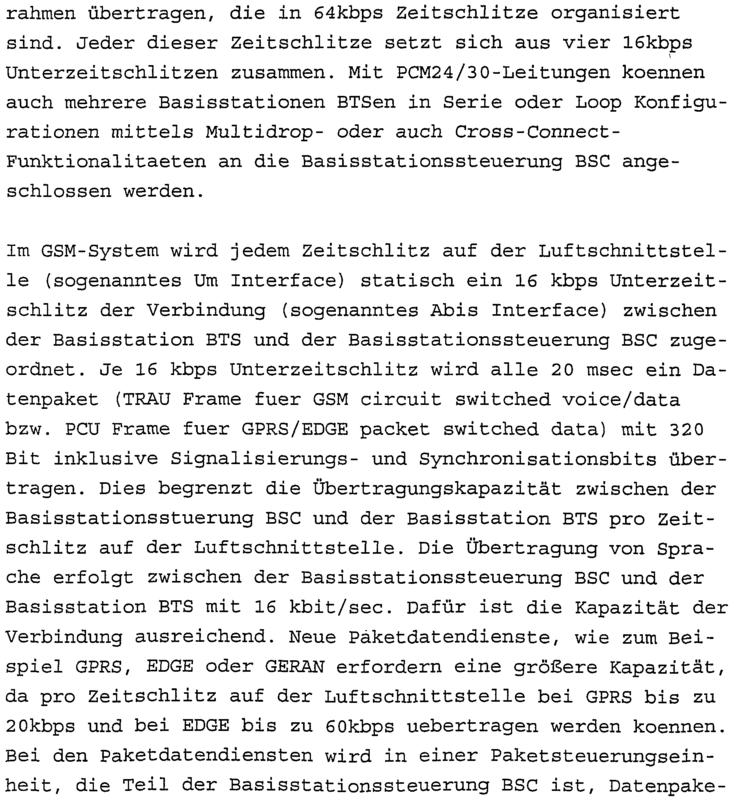 Then, the segmentation of the radio or Funkbioecke no longer takes place for packet data in the Ba sisstationssteuerung BSC ■ but only in the base station BTS '1, ie but also that the frame relay, ATM, or IP data over Gb and Iu must be forwarded via the Basistationssteuerung BSC 'to the base station BTS' ■ and that the base station BTS '1 in their central unit (core unit) c0re x has a packet data interface. - are where the connection of assigned upon completion of the connection time slots released and are back as part of the reserved transmission capacity. 2. The method of claim 1, wherein the transmission line as a line, radio link, fiber optic cable, power line communication and / or satellite link is formed. - This estimate the distance of the mobile station depending on a base station measured by the rate time (Ti ming Advance), this estimate depends on the received level (RXLEV) and signal to noise ratio of access (Channel_Request), - in this estimate also the Kapazitaetsbedarf enters the last connection of the same operators, including the elapsed time since the last access ..
4. The method according to any one of claims 1 to 3, wherein the time slots which are allocated to the connection, are numbered. 5. 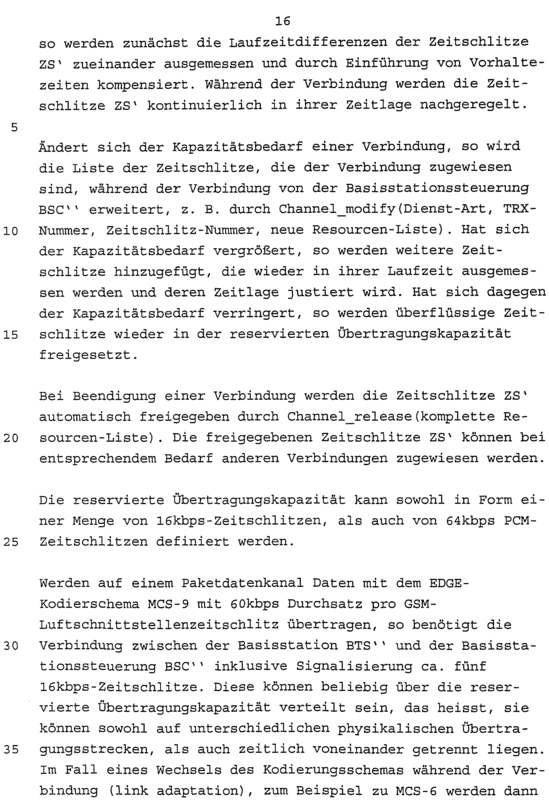 The method of claim 4, wherein on a multiplexed channel with several participants, all participants have the same time slot numbering on all time slots. 6. The method of claim 4 or 5, wherein the transmitting unit is segmented larger data packets according to the numbering of the time slots, and assembling the received unit these data packets accordingly. 7. The method according to any one of claims 4 to 6, wherein the numbering in the time slots will carry with. 8. A method according to any one of claims 1 to 7, characterized in which zusammengehoerige time slots by means of a eindeu- term identification feature. 9. A method according to any one of claims 1 to 8, wherein a time slot to the main time slot is declared and the main time slot has the smallest number. 10. The method of claim 9, wherein the relevant in-band signaling of the connection takes place predominantly on the main time slot. - wherein each time information is transmitted in the time slots from the timing of transmitted in the relevant time slot data segments in relation can be derived on the original data. 12. The method according to any one of claims 1 to 11, wherein the time slots be independently from each other in synchronized timing. 13. The method of claim 11, wherein the timing of the time slots is continuously readjusted by means of the uebertrage- NEN time information. 14. A method according to any one of claims 1 to 13, wherein in case of failure or loss of one time slot of the synchronous data transmission is continued on the remaining time slots of a time slot synchronicity. 15. The method according to any one of claims 1 to 14, wherein the connection is assigned a smaller number of time slots if the reserved capacity in transmission the number of requested time slots is not available. - Release in the compounds of lower priority time slots for a connection higher priority, if the reserved transmission capacity rity the number of requested time slots for a compound higher Prio- is not available. 17. The method according to claim 16, to be moved in the low-priority connections to other cells if the reserved transmission capacity, the number of requested time slots is not available for a connection higher priority. 18. The method according to any one of claims 1 to 17, wherein a compound is displaced bertragungskapazitaet in another cell with free Ü, if in the reserved transmission capacity of the source cell, the number of requested time slots of this service is not available. 19. A method according to any one of claims 1 to 18, wherein during the connection, the number of allocated time slots is dynamically adapted to the requirements of the connection. - in which for the case that the number of assigned time slots is greater than the current requirement of the compound, the compound assigned time slots which are not required to be released. - in which a subset of the vorgege- surrounded transmission capacity is reserved for each base station, are allocated from the time slots for connections via the respective base station. 22. The method according to any one of claims 1 to 21, are reserved in the subsets of the reserved transmission capacity for different services, transmission paths and / or transmission methods. 23. The method according to claim 9 or 22, wherein at least one base station, a service, a transmission path or a transmission method, a subset of the reserved transmission capacity is reserved, having a predetermined minimum size. 24. The method of claim 21 or 22, wherein the size of the subsets in response to the conjunction arise is dynamically changed. 25. The method of claim 23 or 24, wherein a base station, a service, a transmission path or a transfer method bertragungskapazitaet the reserved but free Ü another base station of another service, another transmission path or another transmission method, if necessary used, these Übertra - but gungskapazitaet again if required for disposal presents. 26. The method according to any one of claims 22 to 25, wherein the size of said subsets being such that the sum of the partial quantities is bertragungskapazität smaller than the total reserved Ü. - be at the bertragungskapazitaetendie when establishing a connection and scarce free Ü requirements of connections for the at least one service or transmission path Ü bertragungsmethode with higher priority met by providing existing connections with a lower priority transmission gungskapazitaet. 28. The method according to any one of the preceding claims wherein the transmission capacity reserved for signaling nichtgenutze, software download and other internal traffic between the base stations and the controller is used. 29. The method according to any one of claims 1 to 28, in which the units of the radio communication system between which data transfer takes place, a base station and a base station controller, a base station controller and a transcoder (transcoding and rate adaptation U nit), and / or transcoder (transcoding and rate adaptation unit) and a mobile switching center. 30, base station system comprising a base station and a base station controller, wherein the base station controller having a Kapazitätszuteilungs- unit which is designed such that it is controlled the flow of a method according to one of claims 1 to 29 overall. 31 base station system according to claim 30, wherein the capacity allocation unit produces statistics about the usage of the reserved transmission capacity, number of successful and failed connection attempts or connection modifications and forwards them to an operation and maintenance center. Mobile switching center, at least one transcoder (transcoding and rate adaptation unit TRAU) and at least one packet data node, which is designed such that in the course of a method according to one of claims 1 to 30 on at least one of the interfaces between the mobile switching center and transcoder (transcoding and rate adaptation Unit), between base station and base station controller between the base station controller and transcoder (transcoding and rate adaptation unit) and / or switching center between Mobilvermitt- and packet data node is controlled.